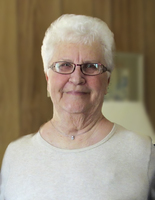 Provide comfort for the family of Edith Zinck with a meaningful gesture of sympathy. It is with great sadness that the family of Edith Madeline Zinck, 86, of Lunenburg announces her passing on Saturday, April 13, 2019 at the South Shore Regional Hospital, Bridgewater. Born in Marriotts Cove, she was the daughter of the late Ralph and Helen (Armstrong) Stevens. Known to everyone as Edie, she left home at 15 to work in Halifax and later Lunenburg, where she met and married her husband Ray and settled down to raise a family. She enjoyed bowling, curling, skating and gardening but devoted most of time and energy to caring for her family. She was a willing volunteer, whether it was driving her children and their friends to games and activities or helping local charities and community organizations. Those who knew her well loved her cooking, from her baked beans that were special request at every Stevens family reunion, her homemade bread, her breaded scallops to her hodge podge made mostly from vegetables grown in her own garden. Edie is survived by her daughter, Susan (Terry) Sheehy, Shubenacadie; son, Stephen (Kay) Zinck, Halifax; sisters, Jean Stevens, Halifax and Adah (John) Durno, Kentville; grandchildren, Kristin, Darcy and Alex Zinck and Andrew Sheehy and several nieces and nephews. She was predeceased by her husband, Ray, daughter, Jane, who died in infancy; sister, Marie (Iyoupe); and brothers Percy, George and David. Funeral arrangements are under the direction of the Dana L. Sweeny Funeral Home, 11213 Hwy. # 3, Lunenburg, where a memorial service will be held on Thursday at 11:00 a.m. Interment will be in Hillcrest Cemetery, Lunenburg. The family would like to sincerely thank Dr. Heather Robertson as well as well as the nurses and staff at South Shore Regional Hospital for their exceptional care, understanding and respect. Flowers from the immediate family only, memorial donations in Edith's memory may be made to Health Services Foundation of the South Shore, the Lunenburg Academy Foundation or charity of choice. To plant a memorial tree in honor of Edith Madeline Zinck , please visit our Heartfelt Sympathies Store. So sorry Sue to hear of your mother's passing. I have fond memories of her when I was visiting next door at my aunts. With deepest sympathies to you , Steven and your families. To Edith’s Family. Sorry to hear of Edith’s passing. She was a sweetheart.